At Low Vision Clinic at Chroma Optics, we understand how important your vision is to live a comfortable, enjoyable life. We provide Retinitis Pigmentosa patients with suitable, high-quality, low vision aids and eyeglasses that will help improve their current level of vision. Whether you are experiencing peripheral vision loss, central vision loss, or night blindness, our low vision doctor, Dr. Dora Sudarsky, will work with you to recommend the perfect low vision aids and eyeglasses for you. We treat patients of all ages at our Vermont low vision clinic. As the eye condition continues to deteriorate along with the loss of central vision, it becomes really difficult to read. To help improve your reading ability, our low vision specialist at Low Vision Clinic at Chroma Optics recommends a suitable low vision aid or eyeglasses for you, such as prismatic reading glasses. Another solution is magnifiers that help enlarge the text. Retinitis pigmentosa often makes it difficult for one to operate their mobile device once they begin to lose their central vision. You will find yourself putting the phone closer to your eyes to read the text. At Low Vision Clinic at Chroma Optics we recommend suitable low vision aids or eyeglasses to enable you to use your phone again. We also recommend various magnifiers to enhance the text. Dr. Dora Sudarsky also recommends custom-made optical systems for patients with Retinitis Pigmentosa. The microscopic and telescopic lenses in the optical system help to magnify images and objects. 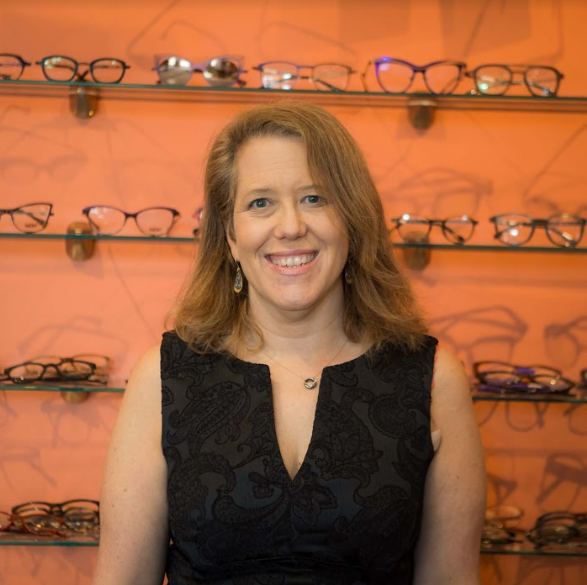 Our low vision specialist, Dr. Dora Sudarsky, will carry out a detailed diagnosis to determine the best low vision aids or eyeglasses for you. Read more about our low vision glasses and aids. Our Low Vision Doctor Dr. Dora Sudarsky at Low Vision Clinic at Chroma Optics recommends low vision glasses, bioptic lenses, or side-vision awareness glasses to help improve your vision and ability to make out faces. Our Low Vision Optometrist, Dr. Dora Sudarsky, helps patients from all over Vermont, with eye diseases such as macular degeneration, glaucoma, diabetic retinopathy, retinitis pigmentosa, cataracts and more, to maximize their remaining vision to its full potential in order to recover and save vision functionality. This is done with the help of highly specialized Low Vision optics/glasses and other vision aids that help patients regain their independence. Dr. Dora Sudarsky, our Low Vision eye doctor, is passionate about helping people in Vermont recover their day to day functioning. Too many patients leave their ophthalmologist or retinologist thinking there is nothing left to be done but manage the disease to prevent further vision loss. Dr. Dora Sudarsky is a member of the International Academy Of Low Vision Specialists (IALVS), the premier organization of Low Vision Optometrists. All members of IALVS receive extensive training to learn how to help patients with vision loss maximize their remaining vision using the latest devices and technology. For many people, proper use of a Low Vision device means being able to read, drive, sew, play cards, watch television, and use the computer—all of which would be impossible without these Low Vision Aids. At the Low Vision Clinic at Chroma Optics, we help patients from Burlington, , , and to enjoy life after vision loss with Low Vision Aids. When you visit our low vision clinic in Burlington, our low vision specialists will recommend suitable coping tips and approaches for you. If you suffer from RP and you think all hope is lost to regain good vision, visit Dr. Dora Sudarsky at Low Vision Clinic at Chroma Optics. With our various low vision aids and eyeglasses, we can help you see again. Using his expertise and experience in the low vision field, Dr. Dora Sudarsky will offer you a lifeline to be able to perform many activities and regain your independence. Contact us today to learn more about our services. An amazing experience awaits you!